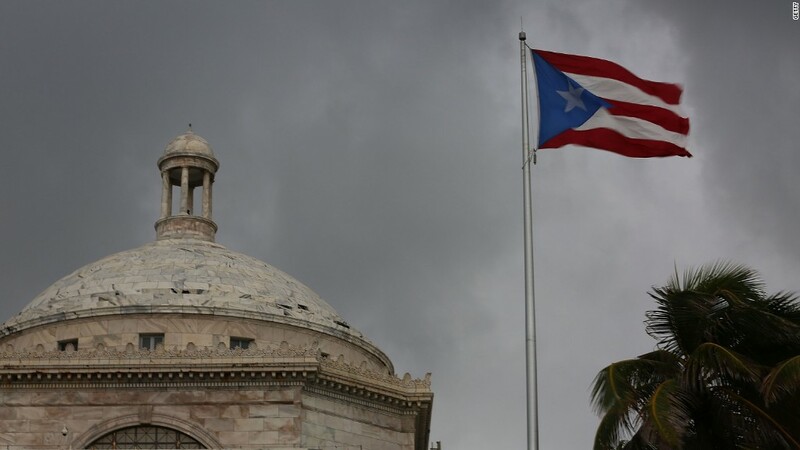 Puerto Rico is in the midst of what its governor calls a "death spiral." The island is in its ninth year of recession, it is neck deep in debt and lenders are knocking on its doors demanding repayments. No wonder, Puerto Ricans are leaving the island in search of a better future for themselves and their children. Puerto Rico's school enrollment -- from kindergarten to college -- has shrunk dramatically to 921,000 in 2014 from 1.14 million in 2005, according to the U.S. Census Bureau. You can call it a brain drain. The students make up two-thirds of Puerto Rico's total population decline. Puerto Rico is in crisis mode these days. It has already defaulted on one debt payment in August and a big debt payment of about $1 billion looms on January 1. The island's governor, Alejandro Garcia Padilla has said it will be nearly impossible to pay it. Padilla is the one who said earlier this year that Puerto Rico's economy was in a "death spiral." "We're out of cash," Padilla told CNN's Richard Quest last week. "It will very, very hard, very difficult to find a way to do that payment on January 1st." Fixing the government's debt debacle may prove easier than its declining population. "Puerto Rico is running out of people to drive away," says Omar Rodriguez, a 26-year-old Puerto Rican with a college degree. Rodriguez left the island in July with his wife to move to Austin, Tex., in search of a better job. Now he's working as a waiter and an assistant teacher at a school in Austin. He admits the transition has been challenging but he sees more opportunity in Texas than Puerto Rico, where he was raised. Rodriguez hopes to be accepted into graduate school at the University of Texas at Austin. Rodriguez is among thousands of Puerto Ricans leaving the island at levels last seen during the "West Side Story" era in the 1950s. Last year, about 64,000 residents left Puerto Rico. That's more than double the rate in 2010, according to the Pew Research Center. Some of the losses are steepest at the grade school level. In the past 10 years, Puerto Rico has lost a third of its school children between grades 1 and 4. So there are about 70,000 fewer kids in those grades now than in 2005. For an island with a total population of 3.5 million people, it's a substantial drop. Between 2006 and 2013, the most common reason why Puerto Ricans left the island was to search for better job opportunities, according to Pew. As if losing students wasn't enough, Puerto Rico's spending on schools has become a thorny issue in its debt negotiations. Even though its student body has rapidly declined, Puerto Rico's government has increased education spending by 39%, according to a report sponsored by hedge funds and authored by three former IMF economists. The report recommended closing some schools. Juan Camacho, a lifetime resident and social activist in Puerto Rico worries about the future of the island. He says there's poverty all around and he thinks that drug crime is on the rise. "The situation is going to get worse," he says.